I've done quite a few showers now, although the greater portion has been baby showers. However, not to insult anyone, but a bridal shower is not that different. People have the same expectations: decor, food and presents! And it is always fun to celebrate, whether for a new baby or a new marriage! This was an especially fun shower to plan because it was for one of my sisters. She *loves* donuts, so it was an irresistible theme choice. She also loves pink and glitz, so we tried to incorporate those, too. The piece de resistance was the donut hole croquembouche! I shamelessly copied this one, from "O Happy Day". I am so glad that I did! It was very dramatic-and while it was quite a bit of work (and a little on the pricey side, but it was cheaper than a big floral arrangement!) it wasn't exceptionally difficult. It did require FIVE boxes of donut holes, though! My sister's fiance was an absolute wonder and delivered four dozen fresh, beautiful, color-coordinated donuts at 9:30 am so they would be just perfect! I topped them off with little flags I whipped up out of washi tape and toothpicks. I also added a little banner that I made from colored circles and skewers. I stuck that in the bride-to-be's favorite kind: maple bars! Putting the donuts in pretty dishes added a little bit of class to these rather humble treats. I couldn't resist adding a little "flair" and some sparkle in her honor. I set up a "sprinkle bar" and used an amazing sprinkle set I found at Michael's and put them in cute little dishes. I also added an array of dipping sauces. Yes, I know that it looks like I spelled sauce "sause", but it really is just my not-fantastic handwriting! Surprisingly, people really enjoyed using the sauces and the sprinkles! I finished the table with a handmade tulle skirt-it took me seven rolls of tulle, but it was lovely. I hung gold circle decorations I got from Hobby Lobby overhead. My mom bought the daisies to finish things off. I put together a little printable of Colossians 3:14, "Above all these things put on love, which is the bond of perfection." and decorated it with a donut printable I got, again, from "O Happy Day"-what can I say? She has cute stuff! My sweet mom and aunt thoughtfully provided all the "not sweet" things. I don't even have it all pictured here! I put these cute flags on toothpicks and put them in the food, and then I used these printable donuts and glued them to skewers to put in the flowers. 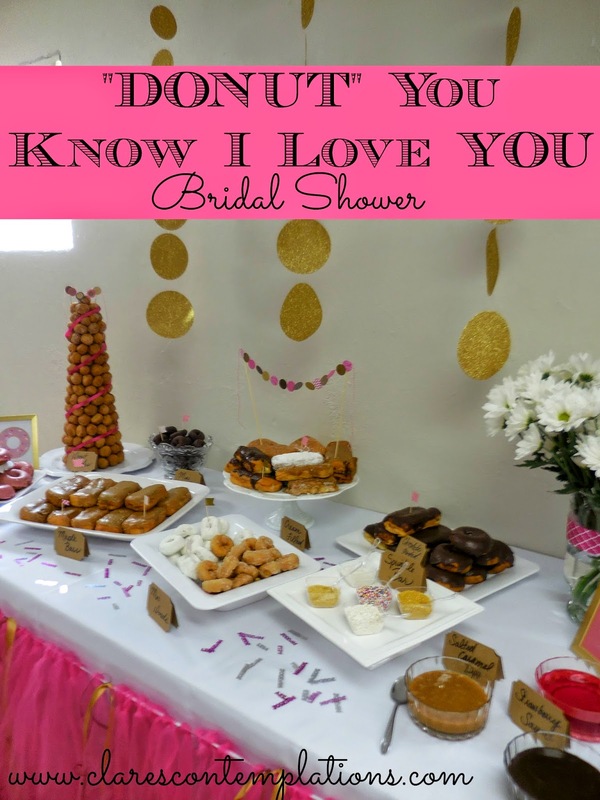 More flowers with donut skewers, a picture of the happy couple, and this cute printable (Free! So great!) graced the drink station. We (Did I forget to mention my charming co-hostess? My next youngest sister, Katy, is the other half of that "we".) bought these pretty sparkling lemonades at Trader Joe's. It was so nice to not have to re-package them! The coffee area was a little more plain, but this donut garland made it a little more fun! We also added colorful dots to the coffee cups to jazz them up a little. I made a crepe streamer backdrop for the gift table. I also made the little banner with the happy couple's names on it. So many people did such a great job with their wrapping-and clearly appreciated the donut theme. I, of course, had to match mine, too! Another appearance of those darn adorable "O Happy Day" donuts! I put together a little breakfast in bed set-hence the tray. My co-hostess provided the inflatable donut-it was just too fun to pass up! We put these little gold stands and some plants in the seating area. My tasty treats! I think the sprinkles really took it to the next level, don't you? The delicious quiche and sausage balls were made by my aunt and grandmother. We also served tasty mocha punch. We had to make sure the bride-to-be coordinated so Katy picked up these adorable donut charms and chains at Hobby Lobby. Our mom had one, too! We packaged up washi tape wrapped votives and candy for "thank-you" gifts. We decorated the favor table with confetti with the bride and groom's names (Party City!) and I used this cute printable and some circles on skewers (It needed a little something and I was short on time! ), too. The extra donuts were for guests to write messages to the couple for keepsakes. It was our version of a guestbook. In all, I had a great time helping to put this together. It is always so wonderful to be able to bless your family with something you really love doing! "Donut" you love it when a party comes together? I "dough"! It is crazy to think that I have been writing these "letters" to you since you were two. That tiny, spiky haired little guy seems a long way away now. I don't think you are the only one who has changed since then, either! It is funny to think that we "get to know" our kids, but that is the truth. The longer I am your mom, the better I know you. And I will admit: that sometimes scares me. Mostly because you are like me in so many ways. You hide that you are sometimes anxious under a tough exterior, but I see it in your eyes-you can be overwhelmed by new situations and you flounder some when a curve ball comes your way. But you are so much braver than I was! You are slowing finding your footing-and realizing that fear doesn't have to be a permanent fixture in your life. You get a little angry and can occasionally shut down when you don't know how to face a problem; I understand. But I always want to remind you-Jesus is with you! Nothing is too hard for Him. And this year, you have really seen how prayer works. So many things that we have been pleading with the Lord for have come back a resounding "Yes!". After months of praying that God would "give Baby Gracey a new heart" you got to hold that answer to prayer in your own hands. Even at your young age you realize that it doesn't get much better than that. You are learning that God not only listens, He cares so much more about you than even your dad and I can-and that's a lot! You are learning so many other things, too. You will still tell people you "can't read", but you can, and you do it really well. You are always afraid of making mistakes, but you need to be a little easier on yourself. You can't do it all perfectly the first time! (Another trait you got from me.) You took Spanish this year at co-op and *loved* it. You love science, too, and right now you vacillate between the career choices of scientist and tow-truck driver. (Mostly because you still want to be just like your dad!) You go on and on about the experiments you do in class and you have replicated several of them for me at home. You always want to share your excitement about the new things you are learning. The latest is telling us all the facts you are hearing about Japan and China in your Asian studies class. We will soon be experts! You are making friends, too, I think mostly because you have so many amazing leadership qualities. At church, at co-op, or even just in the apartment complex, you always are heading up a group of kids. You know everyone's name, and their apartment number, or who their parents are. You really pay attention to the details and I think that's why you make such a great friend. You are a pretty great son, too. You really wanted everyone to wear superhero shirts on your birthday-it was hilarious that you planned everyone's outfit. You also remember everyone's likes and dislikes in the family-colors, food, movies, music. You love to listen to the same songs as your dad and me (which can be pretty drastically different) and you always remember the words. I introduced you to "Awesome God" by Rich Mullins this year-and it was so fun to hear you ask me to play it again. That's a song I grew up with! I could go on and on, but instead of writing it all down, I am just going to keep trying to tell you and show you and your sister every day how much I love you and how amazing I think you are. Your presence in our family never ceases to be a reminder of how God gives such great gifts, even when we are so undeserving. Here's to having an awesome year being 7. I love you. In case you ever wondered, I do not "plan" posts for holidays such as Christmas and Easter. However, it has always been important to me to spend a lot of time thinking about and reflecting on these oh-so-important Christian dates. If I had to classify it, this time spent merely pondering is probably my most important way of preparing my heart, along with praying. I pray that the Lord will open my eyes to something new, a different way of thinking about a particular aspect, or just a completely fresh idea. I detest it when you hear someone complain about hearing the "same old Bible story"-if they don't seem familiar, yet still surprising, honestly: you're doing it wrong. So, this year, I have been mulling over "the Easter story". I hesitate to label it as such, because it is really a whole bunch of stories all woven in together. And you can't really start with Palm Sunday and get a full picture. In some ways, you truly do have to go all the way back to the beginning-as in "In the beginning God created the heavens and the earth". (Genesis 1:1) That may seem a bit extreme, but I am always totally enamored of the fact that every single verse in the Bible points to one thing: Christ, and His redemption of us. But I'm blogging here, not writing a book (maybe someday, Lord willing...) and so I will tell you what keeps coming up in my thoughts this year: Easter, even more so than the 4th of July, is about freedom. Glorious, unfettered, life-altering, beautiful, costly freedom. Jesus died so that *I* could be FREE. And I should live my life in such a manner as to honor that sacrifice. If I believe that the American soldier, hero of our nation and symbol of our country's hard won liberty, deserves to be honored, how much more so the One who gives me the most real, true, form of freedom that can never be taken away and literally not only affects my life but also my soul after death? We would have found it strange, after the great men of the Revolutionary War fought all those battles, if they had decided to leave all the laws of our country exactly the same as before and continued to pay tribute and taxes to the their previous master. What would have been the point? Yet, that is exactly what I do when I refuse to exercise the freedom I have in Christ. When I drown in worry, or fear, or doubt, I am again submitting the the slavery that held me captive before He rescued me. I am bowing down the masters of sin and self that held me captive. I am not only refusing to acknowledge His great sacrifice, I am doing the opposite: I am saying it is a cheap, worthless imitation that doesn't hold the power for everyday living. That may seem like a harsh thing to say, but it is the truth. If I do not live my life in such as manner as to prove that I am free-free to trust in the grace of Christ, free to follow His leading in my life, free to use my gifts to glorify Him, free to believe that He will give me the strength that I need, then I am saying that I do not believe that He really has the power to set me free. And that is the testimony that God has given about His Son. Isn't the greatest fear death? Isn't that truly what is the most binding, enslaving, terrorizing thought for all of humanity? I am afraid that I have to make my life happy, and worry about how to make it perfect and satisfying because deep down I have not dealt with my real fear: that this life is all there is. That death will be the end, or worse yet, that death will be continual, for isn't that what hell is? Death that never ends? But I DON'T HAVE TO FEAR DEATH! See, in the Romans verses above it says, "through Christ Jesus [we] are free from the law...of death". Hallelujah! We are free! He has set us free, and it is a magnificent freedom, fully capable of making the most drastic, 180 degree, death-to-life changes. His death gave us amazing freedom. And all I want to do is to live in a way that honors that. To use my freedom to fully glorify and honor Christ with all that I am. So this Easter, I will celebrate my freedom in Christ. I will remember His sacrifice that not only can change my life, but has, and will continue to do so as long as I acknowledge that I am completely at liberty to depend on Him to be everything I need and guide me. 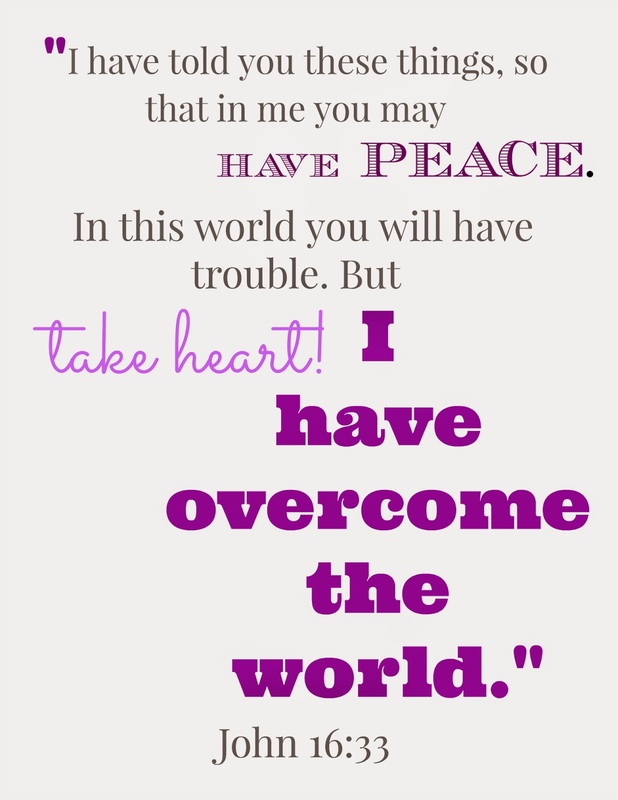 I can rest secure and having peace, knowing He has overcome the world, and won my complete freedom.